All prices subject to site inspection and estimate. All areas to be cleaned must be sound in construction. Any site clearance required prior to works will incur charges. Free access to water supply from customers property is required. 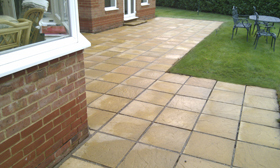 Block paved surfaces may require a return visit as surfaces should be both clean and dry before the re-sanding process. Sealing of surfaces will usually require a separate visit. Rotary pressure cleaning will not revive fading of colour due to age and exposure to daylight (ultra violet light). Oil, solvent and cement stains may not be removed in all cases. 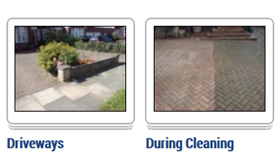 Pressure cleaning may loosen or remove unsound, broken, damaged or perished surfaces, pointing, blocks, paving stones and insecure brickwork. In all cases the cost of any reinstatement will be the customers responsibility. These works can be carried out by us or the customers appointed contractor. Payment by cash or cheque supported by bankers card only. All prices include VAT at 20% unless otherwise stated. INSTRUCTION TO COMMENCE WORKS MEANS ACCEPTANCE OF TERMS, CONDITIONS AND PAYMENT REQUIREMENTS AS STATED ABOVE.